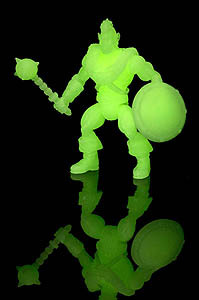 The Glyos News Dump: New Battle Tribes Next Week - Glow! UPDATE: Drop confirmed Monday October 10, 6:00 PM Pacific. Remember when it used to feel like Glyos would go and not do much for months at a time? Well, that's over. On Spy Monkey Creations' Facebook we see plans for another Battle Tribes drop - a very good one - set to hit online shelves in 7-10 days. Glow figures, a figure that looks vaguely like Prince, and some very nice He-Man-ish paint jobs. It's worth checking out. A ton - ton - of pictures of the new figures and alternate heads may be scoped out on their Instagram.